With a book by James Bond author Ian Fleming, and music from the famous brother partnership of Sherman and Sherman, how could this Musical possibly prove to be anything other than a smash hit? For me however, I found this evening's production of the latest tour of this perennial favourite to be really rather Curate's Eggish. My misgivings didn't lie with the music; this, under the direction of Andrew Hilton was firm, strong and wonderful; and it was both a huge joy and surprise for me to hear what a wonderfully sonorous and melodious voice Jason Manford actually has! I knew only of both him and Phill Jupitus from the Stand-Up comedy circuits and have never seen either of them tackle a theatre role before; and I was extremely impressed by both. My misgivings then didn't lie in the acting either; the majority of the cast were excellent, and those whose acting I found to be cardboard cut-out and pantomimic were only doing it that way because they were directed to do so. No, my misgivings lie with the directing and the set. Directed by James Brining, I found that he seemed to place more importance on things technical than on the actual acting and characterisations, and the relationships between characters and their overall development. The show relied heavily on mechanical 'gimmicks' and indeed, the Safety Curtain had to come down for a short spell during the run, as something technical was obviously not going as it should. As an aside, when this happened there was immediately a voice over of Jason Manford as Caractacus Potts saying one of his inventions was malfunctioning or some such diatribe, and that we should stay in our seats and not panic. Since this was clearly a pre-recorded voice - Manford was standing on stage at this point - one was left wondering why the producers found it necessary to make such a recording and how often it is used. What the show didn't have was an array of believable and fully-rounded characters which one does find more in the original film and from previous incarnations of this Musical. Jason Manford as Caractus Potts jnr, was for me, far and away above the rest of the cast in this regard. Admittedly he is hardly ever off stage, and so has more opportunity for character development than others, but his natural style, and very human delivery instantly appealed. Coming in a close second was Caractus Potts snr, played here by Andy Hockley. An actor of the old school who recognised immediately that a comedy character isn't simply comedic for comedy's sake, and the comedy here came from the character, not from trying to be funny. This worked very much in his favour and he was a delight to watch on his every entrance. Phill Jupitus was Baron Bomburst, and also the tiny cameo of Lord Scrumptious which was actually the better character. As Bomburst he did tend to overact a little, and his accent did go through several metamorphoses during the show. However that being said; Vulgaria was most definitely Bavaria in the film version, as their accents and the use of Neuschwanstein attested; but of course Vulgaria doesn't exist and so who am I to criticise an imaginary accent... just as long as that accent is consistent throughout, which it wasn't. Moreover, slightly overacting in such a role can be forgiven too when given licence to do so, and watching co-actors make a mockery of the production completely. I speak of the 'comedy' duo of Vulgarian spies, Boris and Goran (Sam Harrison and Scott Paige) and of the Childcatcher (Jos Vantyler). These three obviously thought they were acting in a pantomime, the former as the two comedy policemen in Aladdin and the latter as King Rat. All three were obviously consummate performers and had the ability to entertain well; I simply cannot understand why the director allowed or even wanted them to be so overtly mono-dimensional and over-the-top. My misgivings also concerned the set. I understand obviously that the full depth of the stage could not be utilised due to the hydraulics for the car, but using the same few flats continuously with little or no variation to them, for a Number 1 tour with star names in the cast seemed a little plain, unadventurous and yes, boring! The projections, of which there were many, didn't work particularly well either. In order to cover such a large scape, there would only be one place in the entire theatre where these projections would be fully in focus and look good; and it wasn't where I was sitting! Most were out of focus, didn't present the true colours, and none managed to obliterate the background they were being projected on. The ones which worked best were those towards the end when the car travels down the country lane to the beach, and then is chased by the Vulgarian war ship. Other smaller and more kitsch ideas, such as the projections for Hushabye Mountain were simply unnecessary, out of place and distracting. With an excellent and rather underused ensemble the best number in the whole show was of course 'Me Ol' Bamboo', and I also thought Charlotte Wakefield's 'Doll On A Music Box' was excellently measured and choreographed. Such a pity that Manford couldn't have been more acrobatic for his clown routine. All in all though, this was a splendid production with much to like and enjoy. 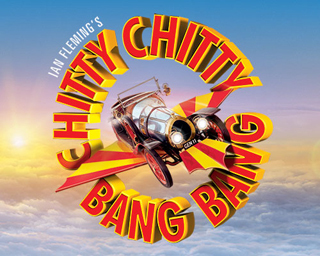 I am uncertain that those going for the first time would fully understand the story, but they would certainly love the full chorus choreographies (Stephen Mear) and of course the 'star' of the show Chitty Chitty Bang Bang herself. Credits here to builders MDM Props Ltd; automators Stage One Creative Services Ltd, and effects by Scott Hope and Blue Chilli Flying.